Staff members, parents and community members attended Monday night’s Sidney City Schools Board of Education meeting to learn how the board would vote on the district’s reconfiguration, which includes bringing the preschool program to the Whittier Elementary School. The plan was approved by a 5-0 vote. SIDNEY — The proposal for Sidney City School’s reconfiguration was approved during Monday night’s Board of Education meeting. The 5-0 vote by board members means beginning with the 2019-20 school year, preschool students currently educated at Shelby Hills will be brought back to the district and yaught at Whittier Elementary School. Other changes associated with the plan calls for all kindergarten to second-grade students to be taught at either Longfellow or Emerson Elementary Schools. All third- and fourth-graders will be taught at Northwood Elementary School. Sidney Middle School will now be home to all fifth- through eighth-grade students. Prior to the vote, five district residents spoke out against the proposal during the public participation portion of the meeting. “As a taxpayer, I’m worried about the change,” said Susan Kinsella, of Sidney. “Money is being spent on an older building (Whittier)” to prepare it for the preschool students. Shelby Hills, she said, already has all the bathrooms needed, is air conditioned and has the toys and equipment needed for the special needs students. Chod and Amanda Dagenfield, of Maplewood, also spoke out against moving too quickly with the proposal. When discussing financing the proposal, Chod feels some of the items don’t have hard numbers to support the change. Chod claims it will cost the district approximately $100,000 to run the preschool. If the preschool stays at Shelby Hills, and the reduction of 25 staff members due to the reconfiguration is factored in, the district will be saving $625,000 per year, if the average staff salary is $45,000 per year totalling $1,125,000. “I’m challenging the speed of this,” said Chod. “There has only been five days between the proposal communication meeting and this board meeting where there is a vote. There’s still a lot of open ended questions: what will be the funding costs? What will be the renovation costs? “It’s hard for me to support this,” he continued. “There were two meetings between Sidney City Schools and Shelby Hills. The first meeting was Shelby Hills telling the changes for the costs and the second was Sidney City Schools saying they were moving the preschool in house. She said her unanswered questions include who will contract with the therapist for the students; what about busing; what about Whittier renovations needed for the preschool program; and what is the cost for the teachers to get intervention training. “Why are you rushing such an important decision?” she asked. “If you wait until the 2020-21 school year, you’ll have time for the renovation (at Whittier), training for the teachers and IEP training and meetings. You are rushing into a decision that’s not best for our preschool students. Christina Mullennix, of Sidney, said she is the “face of the low income family” for Sidney City Schools. She questioned how much the preschool program will cost parents. She said for the reconfiguration to succeed, the busing has to be in place. Jason McLain, business operations director, said he is working with the transportation coordinator and his secretary, who is the former transportation coordinator, about busing for the 2019-20 school system. McLain said busing for the upcoming school year is usually completed in July. Because of the changes with the reconfiguration, they are working on the routes now. The routes, he said, will be finalized in July. He also said on the school’s website there will be a map that shows the changes in the routes for next year. The map should be on the website by the end of the week. McLain said the district is also considering shuttle bus type system for students who live outside the 2 mile area. “The shuttles will be used for a year as a transition,” said Humble. “We’ll also have staggered starting times for the buildings” which will help parents who have students at multiple buildings. After listening to the comments, board President Bob Smith addressed those present. “I like the passion that has come out in the community,” said Smith about the proposed changes and community response. “All board members are passionate about the kids and their education. We have 3,300 students and we have to do what’s best for all of them. We have to be fiscally responsible. We know that changes are hard. Smith said he has heard concerns that the plan will fail. 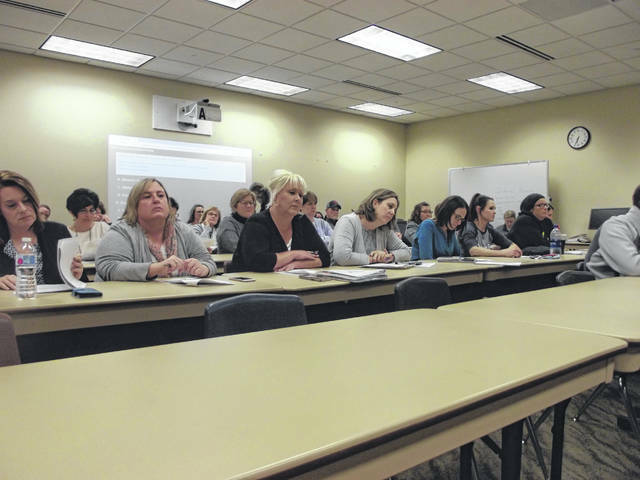 https://www.sidneydailynews.com/wp-content/uploads/sites/47/2019/01/web1_B0Emeeting.jpgStaff members, parents and community members attended Monday night’s Sidney City Schools Board of Education meeting to learn how the board would vote on the district’s reconfiguration, which includes bringing the preschool program to the Whittier Elementary School. The plan was approved by a 5-0 vote.